For the best Punjabi patiala suit neck design, read ahead and shop. Below, we’ve collected 10 ideas that have captured our attention. It is the best that this season has to offer. Read ahead and learn on which occasion you should wear each piece. You may end up buying them, too. The geometric unstitched suit is elegant and sophisticated. This Patiala salwar suit is cut from a cotton-blend and has a geometric pattern around the border. A boat neck gives this piece a sleek fresh edge. Style yours with the matching chiffon dupatta and dewy makeup. 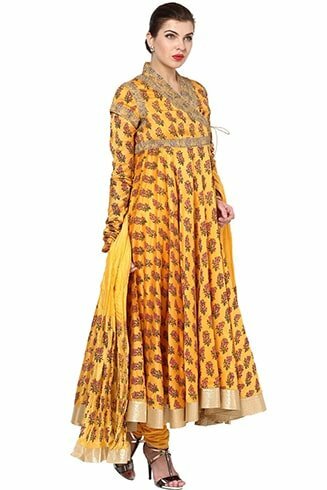 The solid anarkali suit is cut from crisp solid print with patterns. It has romantic collar neck, flared hem, and three quarter sleeves. The palazzos feature a drawstring closure to ensure it stays in place. The set is comfortable enough to wear on a daily occasion. 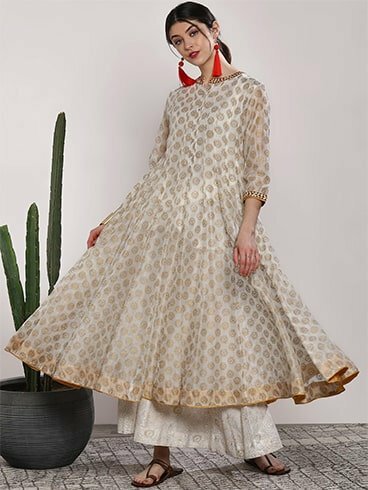 The beautiful off-white embroidered kurta features a mandarin collar, flared hem, three-quarter sleeves, and A-line calf length. Style it with white palazzos to balance the fluid paneled design styling from top to bottom. Libas creates latest Punjabi suits that we instantly fall in love with, like this calf-length set. 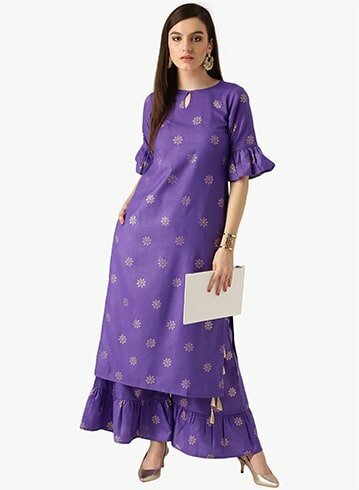 Cut with three-quarter bell sleeves, it is made from pure cotton that’s comfortably stretchy and detailed with hook-and-eye closure, straight hem, and side slits. Wear the suit with the purple and golden printed palazzos. In a retro mixture of green and pink hues, the unstitched suit has floral finish-an essential motif of Patiala salwar suits. It is designed as a free size for a relaxed feel. The green chiffon dupatta is a great addition to the suit. This simple green colored suit with square necked design is made up of 100% pure cotton. It features a calf-length kurta, orange waistcoat, and green chiffon dupatta. This suit is ideal to wear daily. The mustard suit from BIBA is ideal for parties, weddings, festivals, and engagement. Shine with this gorgeous angrakha style anarkali suit featuring printed ghera and churidar sleeves. It has gold embroidery spread all over the yoke. The suit also comes with a pair of cotton churidar and dupatta which beautifully matches the kurta. An embroidered neck as this one looks glamorous. The fine mirror work chanderi embroidery is the highlight of the suit. You can find similar embroidered necked Patiala suits in fabrics like cotton, crepe, silk, etc. The Patiala salwar suit with scoop neck is printed with bold prints. Made from cotton blend, this A-line cut style has a sheer finish along the hands, while the stitching of the bottoms underneath provides comfort. A chic creation of modern style, this white Patiala suit set will make a great addition to your wardrobe. The asymmetrical necked top perfectly blends with the embroidered work. It adds up with the santoon Patiala and net dupatta perfectly blending with the zari work. 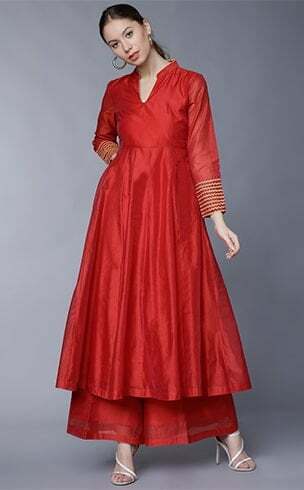 The selection of the neck design greatly attributes to a salwar suit. We hope you loved our collection of punjabi patiala suit neck design. Do you have a favorite amongst these designs? Let us know in the comment section below.